transport, declassification and downgrading, destruction, or administration of classified material, whether in paper or electronic form. Specific guidance concerning these topics is available in Executive Order (EO) 13526, “Classified National Security Information;” Department of Justice (DOJ) Security Program Operating Manual (SPOM); FBI Security Policy Manual (SPM); FBI Automatic Declassification Guide; FBI Foreign Dissemination Manual (FDM); Federal Register, Part V, National Archives and Records Administration (NARA), Information Security Oversight Office (ISOO) Final Rule (32 CFR Parts 2001 and 2003); and other documents referenced herein. 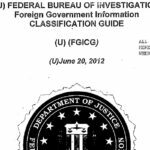 The duration of classification, classification markings, and other requirements of EO 13526, are to be applied to information classified pursuant to this guide, in accordance with the SPM and other approved FBI policies and procedures.